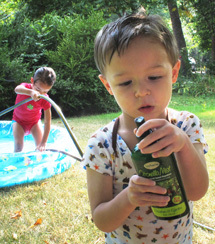 Looking for effective, all natural, DEET-free insect repellent? Our Citronella Mist® contains 8 essential oils known to repel mosquitoes and other annoying bugs. Citronella Mist has been used and loved for over a dozen years. It smells lemony. Safe around food, it's perfect for picnics and barbecues. Citronella Mist won't endanger the environment. You'll need it for gardening, hiking, and all outdoor activities. In summer's heat, you'll appreciate the light, cooling mist. It's free of greasy oils, emulsifiers, and skin-drying alcohol. We don't brag about how many hours of protection you get with one application. You can safely mist as often as you like to suit your biochemistry or surroundings. We offer 3 sizes: 2 oz travel and pocket, 4 oz camping and car, 8 oz economical home size. Lemon eucalyptus, a natural, lemon-scented oil made from a tree, Eucalyptus citriodora. It is not to be confused with synthetic "oil of lemon eucalyptus," a.k.a. para-menthane-3,8-diol, used in many commercial repellents. Catnip contains the compound nepetalactone, which is considered 10 times stronger than DEET, according to an Iowa State University study. Citronella, the essential oil from a tropical grass, has been registered as an insect repellent in the United States since 1948. Lemongrass and thyme are classified as active ingredients in minimum risk pesticides. Citronella Mist meets the requirements for minimum risk pesticides exempted from FIFRA regulations (Federal Insecticide, Fungicide, and Rodenticide Act), under the United States Environmental Protection Agency. Citronella Mist is harmless to children. The FDA recommends that children under 3 avoid synthetic lemon eucalyptus (para-menthane-3,8-diol). By contrast, we use natural essential oil of lemon eucalyptus. Additionally, all the essential oils in Citronella Mist are well diluted. Still, children and others may be sensitive. Use your best judgment. Perhaps apply Citronella Mist to the clothing of infants and toddlers rather than directly on their skin. Can I use Citronella Mist on my dog? When mosquitoes are biting, we spray Soapy's coat before she goes outdoors. Additionally, we use heartworm, flea, and tick control from the veterinarian. If your dog is bothered by pesky insects, give our Mist a try. Let us know how it works for your pup. “I had the great opportunity to attend 'Casting for Recovery' earlier this month. It was an experience that I will always cherish. “I must say that I was a bit afraid to attend because of possible mosquito/tick bites (a few years ago I got a tick bite and ended up in the hospital). So your gift of the special soap and spray were absolutely the perfect thing to find on the first day when we got to our rooms - they were waiting for us on our beds. I have to tell you that I did not get any bug bites; I did, however, get several nice trout biting on my line! “At our bar-b-cue, we and our guests appreciated the protection of your Citronella Mist. And it didn't spoil the ribs." Be sure your soap is not attracting bugs. Our Camper's Choice bar and Camper's Choice Luffa Soap contain the same blend of essential oils as Citronella Mist. For ticks, tuck your pant legs into your socks and seal the tops of the socks with duct tape. Ticks trying to crawl through to your skin will get stuck on the tape before they can bite you. Keep another strip of tape handy to lift off the ticks as you spot them on your skin and clothing. 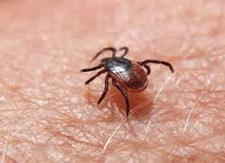 Ticks take some time to attach themselves to you. After an outing, thoroughly inspect your body. A hand mirror and/or a close friend can help. Remove ticks with duct tape if possible or use a tick removal tool to pull them out gently. If you use tweezers, take care not to squeeze their bodies too hard because you want to prevent their innards from entering your bloodstream through their mouths. As you remove ticks, trap them on some sticky tape. For tick-infested woods, try permethrin treated protective gear such as Repel Permanone Insect Repellent Clothing & Gear Spray. This seriously toxic insecticide is not to be sprayed on the skin. It must be applied hours in advance in order to dry on your clothes before you wear them. Be sure to follow the instructions on the can. For more information, visit the Centers for Disease Prevention and Control (CDC). For chiggers, it is suggested to take a shower within four hours of exposure and scrub very well with a washcloth or luffa. Powdered sulfur, though the smell is offensive to some, is said to be effective. Repel Permanone Insect Repellent Clothing & Gear Spray can help also. Read and follow the directions. When does mosquito season begin? 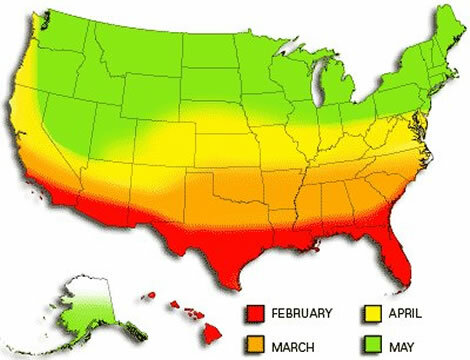 Mosquito season begins once the temperature is consistently about 50°F (10°C). At about 50°F, female mosquitoes feel safe to start laying their eggs. Depending on where you are in the country, this time of the season varies. Each bottle of Citronella Mist counts as 1 bar toward our free bar offer.